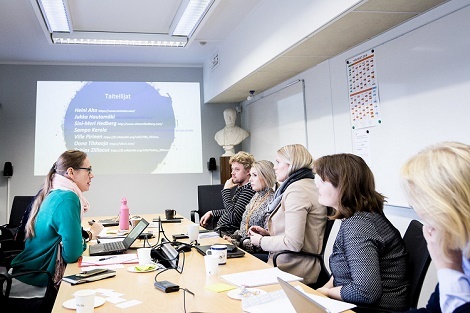 Aboa Mare's R&D project IRM-Tool has finalized an interesting pilot process with Meyer Turku, Arctech Helsinki Shipyard and Wilhelmsen Ships Service and seven professional Finnish artists. After three months of creative work, nine different artistic solutions by professional Finnish artists are accomplished and represented to companies. Finalized art concepts were presented by artists Heini Aho, Jukka Hautamäki, Sini-Meri Hedberg, Sampo Kerola, Oona Tikkaoja, Ville Pirinen, and Tobias Zilliacus. This unique process was organized by IRM-Tool project financed by European Social Fund in co-operation with Art Promotion Centre Finland. Companies represented three different challenges each in the beginning of December 2018. Challenges provided were carefully selected to have well defined and concrete challenges for the process. Challenges included themes of safety, quality, product development processes, image of the companies, and communication and co-operation in the companies. Companies and artists met three times in common workshops, and artists visited the companies. Concepts included for example expertise of gamification (Oona Tikkaoja), neural networks (Jukka Hautamäki), music, dance, light art (Sampo Kerola), drawing (Sini-Meri Hedberg), comics (Ville Pirinen), combination of science and art (Heini Aho), art and theatre (Tobias Zilliacus). All concepts responded to challenges with communal solutions that provide company employees a challenge to learn from each other, share their expertise and commit not only to common values and rules, but innovation and development. Workshop 11.12.2018 at Aboa Mare. Artists discussing concepts with representatives from Meyer Turku. Workshop 11.12.2018. Wilhelmsen Ships Service is presenting its challenges. Workshop 11.12.2018. Discussions about the Arctech Helsinki Shipyard challenges. The aim for this workshop was to look for new angles for product development, added value for the customers, co-operation between creators and production and innovations with the customer in focus. Designer and entrepreneur Marja Rak, who has wide experience in product development, brand development and co-operation with customers, facilitated the workshop. The event language was Swedish. 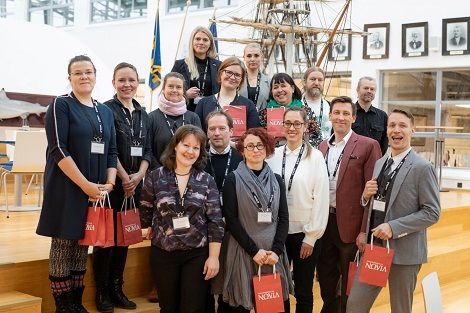 The IRM-Tool project and FCR Finland arranged a future-oriented workshop at the visitor and innovation centre JOKI on 10 September. The workshop was arranged as part of FCR Finland´s networking event, where they launched new products. Workshop had about 50 participants from Finland, the Baltic region and from other European countries. The goal was to build a common vision of the future within the field, so that working together gets easier and better. Kirsi Kostia and Niko Herlin from Great Minds Ltd facilitated the workshop. The participants thought of future challenges within the field: What future phenomena effects their own work? In addition, which are not effecting? What are the concrete possibilities and threats, and how should the field be prepared? An on the other hand, could the threats be formed into possibilities? The participants thought that the following phenomena would affect their field the most: 3D printing, the aging population, big data applications and the development of nanotechnologies. The phenomena were picked from the platform www.futuresplatform.com. The phenomena were both rising and descending trends. The mood at the workshop was good and at the end, the threats were turned into possibilities. About 20 women consisting of members from Wista (Women’s International Shipping and Trading Association) and artists from various creative fields participated in the Work stories workshop and Wista´s Fall Gathering on 23 August 2018 at Aboa Mare Training Centre, Turku. The goal for the workshop was to recognize knowledge through storytelling situations in which the participants had succeed and felt appreciated but also failed, or felt underappreciated, or misunderstood in their working life. This a way to recognize and acknowledge e.g. barriers for innovation and development work in the organization. Janne Junttila and Anni Linko from the company called Junttila&Linko facilitated the workshop. Visual artist Salla Lehtipuu illustrated the women’s stories. The women were divided into two groups, were they discussed their carrier experiences. At the end, both groups had one story picked for live visualization. Besides, live illustrator Salla Lehtipuu produced a mind map for the themes that existed in the stories. The event language was Finnish. Nowadays digitalization is forming a big part of our lives and of every industry; It is an important part of industrial development and a way of achieving more with less efforts, more accurate results and less mistakes. In maritime industry development, digitalization is taking important role in many aspects e.g. extremely detailed technical parts within difficult luxury interior design, building an autonomous vessel, entertainment, training and many other things, but how we can bring all parties together? Therefore, the collaboration between both creative and maritime industries is important and potential topic for codevelopment. It allows for discovering and innovating new digital era in the maritime world. 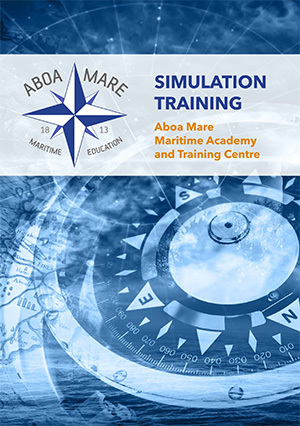 In this workshop, the gaming industry met maritime industry, and both needs & challenges in meeting them was explored. At first, Dr. Mika Luimula, docent of game technology & Leader of Turku Game Lab www.turkugamelab.fi, introduced ”How AVR Turku Innovation and Competence Factory can support digitalization needs in marine industry?”, and Pasi Porramo, the CEO of Ade www.ade.fi answers ”How to improve the installation works and quality on board the vessel by using digitalization?” Accordingly, the participants then discussed what kind of digitalization needs & ideas they have in their organizations, and the gaming industry & its opportunities was explored. There is exceptional knowledge in boat building and hand-made creativity in the Kvarken Region, but how much does the network recognize and utilize it? In this workshop the architect Ann-Charlott Hästö built identity based on the companies knowledge and discussed about how that can be utilized in marketing and innovation processes. Recognizing key knowledge, identity and network potential is also a good phase to build for new collaboration as proudness of the exceptional knowledge and commitment to the region is something all companies share. First Hästö guided with her own experience sand innovation methodology, and then the identity was built with familiar materials the companies use daily; leather, fabrics, wood, and decoration…Thus, all had a memory of the day and their identity in a form of a key ring. Mikko Varjanne from FCR-Finland introduced the specifics how ship interior design and its processes differs from offshore regular interior design, and also how interior design in ship newbuilding differs from refurbishment & repairing. FCR-Finland has developed a lot of sustainable solutions from utilizing e.g. recycled material, but also been able to produce cost savings for operations to ship owner, with e.g. more fire safety & lighter products. Creative perspective to the topic provided help also by creating value with edutainment, story-telling, gamification & different multifunctional & transformable design solutions with technology, material selection & user-oriented thinking. Approximately thousand ships are demolished every year, and the number is rising. EU regulation that demands the ships to be demolished safely & responsively will be completed in 2020. Learn about what is the worst and best scenario to Finnish maritime industry, and what we can do to make the ship recycling competitive in Finland. The discussions still focus on the costs of ship recycling or demolition, but what about the costs of ‘losing’ European ship owners? And what kind of value creation and business opportunities are possible? Feedback got from both Maritime & Creative Fields, and the project responded! The event was organized to introduce’ the world of shipbuilding’ to the creative fields& test how the participants from two different fields can collaborate in a concrete maritime challenge. Learn about how the event ended up to deal with a topic of modularization, and what the participants felt should be done to match the creative & technical solutions in modular construction projects better. A kick-off event for the IRM-Tool project! The event was organized to explore the creative job opportunities in Maritime Industry & to present the state-of-art simulators& VR-glasses, that are used in maritime training. Learn about what creative fields feel they can offer for the maritime industry, and what kind of challenges exist in collaboration between the fields.